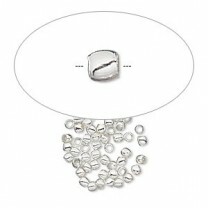 Crimp, silver-plated brass, 2mm round with 1.3mm inside diameter. Sold per pkg of 40. Crimps are to be used at both ends of all beading wires to secure the strand and are commonly used for floating necklaces to secure beads.